Colin Lewes Hanks (born Colin Lewes Dillingham; November 24, 1977) is an American actor, director and producer. He is known for starring in films such as Orange County, King Kong, The House Bunny, and The Great Buck Howard. His television credits include Roswell, Band of Brothers, Dexter, Fargo, The Good Guys, and Life in Pieces. He is the eldest son of actor Tom Hanks. Hanks was born and raised in Sacramento, California, the eldest son of actor Tom Hanks and his first wife, producer and actress Susan Dillingham (known professionally as Samantha Lewes), who died of cancer on March 12, 2002. His surname was changed to Hanks after his parents married in 1978. Hanks attended Sacramento Country Day School, and then Chapman University, before transferring to Loyola Marymount University. He left without earning a degree. In 1999, Hanks won the role of Alex Whitman in the science-fiction series Roswell, where he appeared for the first two seasons (making a brief appearance in the third). During that time, he acted in the teen comedies Whatever It Takes with Shane West and Get Over It with Ben Foster. Hanks also made an appearance in an episode of The OC. He appeared in part eight of HBO mini-series Band of Brothers as Lt. Hank Jones. In 2002, he starred in his first film as Shaun Brumder in Orange County, alongside Jack Black and Schuyler Fisk. The comedy features Hanks trying to get into Stanford University after his guidance counselor mistakenly sends out the wrong transcript. In 2005, he appeared in the remake of King Kong, playing the assistant to Jack Black's character. In 2006, Hanks had a cameo role in Black's Tenacious D in The Pick of Destiny, playing a drunken fraternity brother. He starred in the romantic comedy The House Bunny, playing Oliver, a charming manager of a nursing home and the love interest of Anna Faris' character. In 2008, he appeared in The Great Buck Howard, which was produced by his father and also starred John Malkovich. He also played Father Gill, a young Roman Catholic priest, in season 2 of the TV show Mad Men. In 2009, he made his Broadway debut, acting alongside Jane Fonda in the Moisés Kaufman play 33 Variations. In 2009, Hanks began work as director on All Things Must Pass, a documentary about Tower Records, that premiered March 17, 2015 at South by Southwest in Austin, Texas. Hanks starred in the 2010 Fox TV series The Good Guys as young detective Jack Bailey, alongside Bradley Whitford who played an old-school detective (Dan Stark). In 2011, he starred in the indie film Lucky, alongside Ari Graynor, Ann-Margret and Jeffrey Tambor. He also joined the cast of Dexter for season six opposite Edward James Olmos, where he portrays an art historian Travis Marshall who is involved in a murderous apocalyptic cult. In 2013, he starred as Allison in the second season of the web series Burning Love. The same year, he also portrayed Dr. Malcolm Perry in the historical film Parkland. In 2014, he played Officer Gus Grimly in the FX television series Fargo, for which he received Critics' Choice Television Award and Primetime Emmy Award nominations. In 2015, Hanks began a voice role in the show Talking Tom and Friends. He voices Talking Tom, the main character. Hanks directed the documentary All Things Must Pass: The Rise and Fall of Tower Records, released in 2015. The film received funding of nearly $100,000 through a Kickstarter campaign. Hanks also provided the voice of Luke in the series PAW Patrol. In 2017, Hanks appears as the Adult Alex Vreeke in the film Jumanji: Welcome to the Jungle. In 2018, Hanks portrays a young Mr. Rogers on the Comedy Central show Drunk History. The same year, Hanks appears as a guest judge on Netflix's baking competition Sugar Rush in Season 1, Episode 5; this episode was titled "Sweet Geeks" and Hanks presided over three rounds of cupcakes, desserts and ultimate cakes. Hanks dated Busy Philipps in the 1990s, while in college. In June 2009, Hanks became engaged to former New York publicist Samantha Bryant. The couple married on May 8, 2010, in Los Angeles. Together, they have two daughters, one born in 2011, the other born in 2013. Hanks is a San Francisco Giants baseball fan and attended their World Series-clinching victory in Texas in November 2010. He also directed a 30 for 30 short about their disastrous Crazy Crab stint in the 1980s. He is also a fan of the San Francisco 49ers, Sacramento Kings, and Los Angeles Kings. He was the official Kevin and Bean LA Kings playoff correspondent for the 2012 and 2013 seasons. 2001 Band of Brothers Lieutenant Henry Jones Episode: "The Last Patrol"
2004 The O.C. Grady Episode: "The L.A."
2011 Robot Chicken Sam Witwicky / Vanity Smurf (voices) Episode: "Terms of Endaredevil"
2012 Happy Endings Himself Episode: "Cocktails & Dreams"
2012 Comedy Bang! Bang! Movie Cop Episode: "Paul Rudd Wears a Red Lumberjack Flannel Shirt"
2013 Key and Peele Director Episode: "The Power of Wings"
2013 Ghost Ghirls Tom Wellington/Bloody Bat Episode: "Field of Screams"
Guest role (season 2), episode: "Palindrome"
2015 Mom Andy Dreeson Episode: "Godzilla and a Sprig of Mint"
2015 Comedy Bang! Bang! Himself Episode: "Colin Hanks Wears a Denim Button Down and Black Sneakers"
2019 Big City Greens Mark (voice) Episode: "Skunked" / "Axin' Saxon"
^ State of California. California Birth Index, 1905-1995. Gives name at birth as "Colin Lewes Dillingham"
^ Anthony D'Alessandro (2014-08-13). "Colin Hanks Talks 'Fargo' and Career: Emmy Q&A". Deadline. Retrieved 2014-12-12. ^ Alison Martino (2015-03-09). "The Legendary Past and Celluloid Future of Tower Records on the Sunset Strip". Los Angeles Magazine. ^ Gina DiNunno (September 4, 2009). "Colin Hanks and Jeffrey Tambor Get Lucky". TVGuide.com. Archived from the original on June 13, 2010. Retrieved September 8, 2009. ^ "Colin Hanks' 'Dexter' Role Revealed". The Huffington Post. May 10, 2011. Retrieved October 20, 2011. ^ Ern, Matt (October 19, 2011). "T.V. That Matters: 10/20 "Smokey and the Bandit" and "Mr. Bob's Toddle Kaleidoscope"". Hofstra University. Retrieved October 20, 2011. ^ Talking Tom and Friends (19 January 2017). "Talking Tom and Friends – Meet the Cast". YouTube. Retrieved 1 July 2017. ^ Talking Tom and Friends (20 April 2017). "The Voices of Talking Tom and Friends – Behind the Scenes". YouTube. Retrieved 1 July 2017. ^ a b "Colin Hanks Is Officially Off the Market". May 9, 2010. Archived from the original on April 19, 2013. Retrieved July 3, 2013. ^ Julie Jordan (3 February 2011). "It's a Girl for Colin Hanks". People. people.com. Retrieved 2011-11-04. ^ Michaud, Sarah (July 2, 2013). "Colin Hanks Welcomes Daughter Charlotte". Retrieved July 2, 2013. ^ Exclusive Interview: Colin Hanks. Playmakeronline.com (2011-09-14). Retrieved on 2014-01-14. ^ Podkast with Colin Hanks: "Dexter," Bay Area sports, and the Sacramento Kings - Los Angeles Lakers Blog - ESPN Los Angeles. Espn.go.com. Retrieved on 2014-01-14. ^ Colin Hanks talks on Kings, 'High School' - Entertainment, Pop Culture, Style and Hot Trends - Trending Blog - ESPN Playbook - ESPN. Espn.go.com. Retrieved on 2014-01-14. ^ Kevin & Bean Podcasts – May 2013 « The World Famous KROQ. Kroq.cbslocal.com. Retrieved on 2014-01-14. 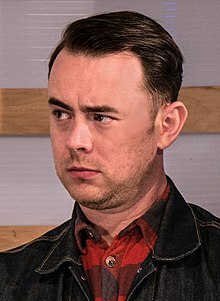 Wikimedia Commons has media related to Colin Hanks.